Kent’s life falls apart, to the point that he and his small son have fled for their lives. 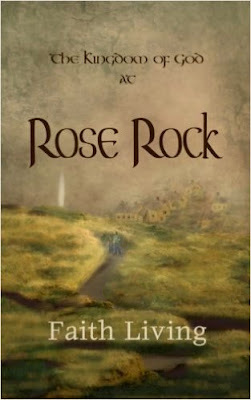 Alone and starving, they go searching for Rose Rock, an urban legend of sanctuary somewhere in the nearby rural desert. But the search becomes futile and Kent accepts that inevitable death is approaching. Suddenly they are invited by an angel into Rose Rock and step into the peaceful, supernatural community where amazing miracles happen every day. Inside Rose Rock, every person hears and speaks to God as clearly as they speak to each other. Their community is structured without rules and God has no plans for judging the chaotic world outside. Here, He has brought a piece of heaven to earth and created a circle of love and comfort He intends to spread worldwide. It is a utopian environment where He is apparent to everyone and freely shares everything. This is a one-of-a-kind novel full of the faith and hope that God has a good plan for our world and may be secretly creating it right under our noses, if only we would see. Faith Living, explores her vision of what heaven on earth might be like in a practical and yet, supernatural sense. Setting the stage for a community without the traditions of religion, hidden from the chaos of the outside world, she paints a picture that might look similar to a vision in the recesses of your own soul. The Kingdom of God at Rose Rock may shake doctrines and shift paradigms, but they may be ones that needed to be shaken and shifted. Questions about God’s plan for the earth are ever present in our world, and many groups have embraced interpretations full of doom and gloom. Faith asks the question, “what if the book of Revelation was never talking about events that would cause the end of the world, or a rapture, or a battle of Armageddon?” After all, these particular interpretations were never known by the church in Jesus’s day and have only become popular in the last 150 years. What if they are wrong? What if we were never meant to read Revelation or other Biblical prophecy literally for our point in time? What if our expectations are ungrounded and God’s intentions are different? What if this is a world without end? Might the chaos on earth bring a transformation resulting in heaven on earth? Might that transformation force us to change our minds and see the goodness of God on earth? What might that process look like? How would it function? How would people behave? What would be different? These are the questions Faith asked and searched her heart to find. After all, if the Kingdom of God is within us, then it would stand to reason we could find it there and see it. The Kingdom of God at Rose Rock is not intended to be THE irrevocable plan. That is because Faith discovered the vision within her was fluid. It conformed to her growing level of inner faith and trust in Father God. Since that relationship is ever-growing, so is the vision. The Kingdom of God at Rose Rock will spark your interest in finding the vision within your own heart and discover its fluid and miraculous reality. Faith Living was born a Pentecostal/Charismatic PK (preacher's kid) who took a "walk-about" on her own with Father God. It lead to insights and revelations that she's been sharing on her Blog and Facebook page. She lives in Southern Colorado with her husband and family in a rural community of sunsets and mountain views.